With the panoply of gods, goddesses, saints, prophets, and gurus who are venerated by India's six major religions, it's not surprising that the subcontinent is awash with festivals. 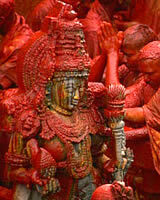 Hinduism's vast canon of myth and history is the wellspring for the majority of these celebrations. Diwali (the Festival of Lights), the five-day festival marking the triumph of good over evil, and Holi, North India's springtime festival, where revelers douse each other with colored powder, are among the most popular. But the Hindu calendar is brimming with festivals for specific gods and those held at individual temples as well as pilgrimages to holy sites, such as the Magh Mela. The more than 150 million-strong Muslim community holds celebrations for Id-ul-Fitr, the feast that ends the 28-day Ramadan fast; Muharram, which honors the martyrdom of the prophet's grandson; and the Urs, at Ajmer, Rajasthan, marking the death of a Sufi saint. 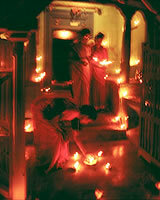 Each year Buddhists honor the birth of the Buddha and Sikhs hold festivals related to the lives of their gurus. 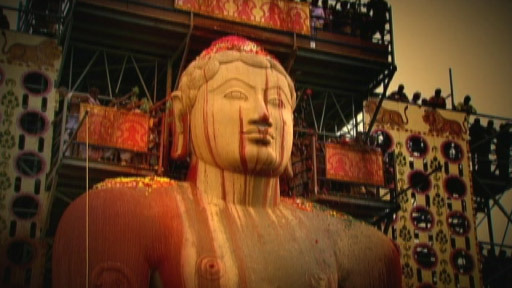 Jains celebrate the birth of Mahavira and, every 12 years, mark the life of one of their saints, Bahubali, with the Mahamastak Abhishek at Shravanabelgola. 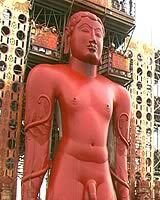 Festival participants are shown here next to the Chauri Bearer sculpture at the bottom of the 57 foot tall statue. According to Jain scripture, Bahubali was the second-born of the one hundred sons of the first tirthankar (Jain teacher) Adinatha (also known as Rishabhadeva). When Adinatha renounced his kingdom, he divided it between his sons, Bharata, the eldest, and Bahubali. Bharata’s ambition to become the supreme ruler of his age led him to capture neighboring kingdoms, but Bahubali would not cede his territory. To avoid unnecessary bloodshed, the two brothers decided to fight each other in three separate contests—of sight, water, and physical strength (wrestling)—each of which Bahubali won. After the last contest, Bahubali became disillusioned by the quest for power that set him against a family member, and he renounced his kingdom to seek spiritual enlightenment. Bahubali became an ascetic and stood meditating for so long that anthills formed on the ground near his feet and vines grew on his legs and spread to his arms. Enlightenment still eluded Bahubali because he could not free his mind from the thought that he was standing on his brother’s land. When Bharata came and prayed at his feet, Bahubali was able to free his mind and achieve enlightenment and salvation. In the 10th century CE, Chamundrai, a general and chief minister to a Ganga dynasty king, had a statue built of Bahubali on a hilltop in Shravana Belagola. It has become a revered Jain pilgrimage site that draws millions of followers every 12 years for a spectacle, the Mahamastak Abhishek, during which a 57 foot tall statue of Bahubali is anointed with saffron, milk, flowers and numerous other symbolic items. A chauri bearer is a roughly six-foot tall highly carved and ornamented statue of a male figure carrying a fly whisk (or "chauri") at the foot of the statue of Bahubali. A matching female figure is found on the other side of the statue. These statues are often found in pairs at the foot of larger statues, as attendants. The festival's name comes from the Sanskrit word "Deepavali," which means "row of lights," and during the five-day celebrations, Hindus decorate their homes and businesses with oil lamps (diyas), candles, or strings of electric lights. The festival commemorates an episode in the Hindu epic, the Ramayana, when Lord Rama, his wife Sita, and brother Lakshman make their triumphal return from a 14-year exile to the city of Ayodhya after defeating the demon-king Ravana. Ayodhya was illuminated to mark their return, which is replicated during Diwali with the lighting of lamps and firework displays that also symbolize the victory of good over evil and light over darkness. In addition, the lamps are intended to welcome Lakshmi, the goddess of wealth and prosperity, who is the focus of religious worship during the festival. Hindus pray to her, at temples and home altars, in the hopes that she will bring happiness and success in the coming year as Diwali also marks the start of the Hindu New Year. Gifts and boxes of Indian sweets are exchanged between family, friends, and business associates. Homes are cleaned and their entrances adorned with decorative motifs (rangoli) made of colored chalk, rice or flour, which usually include a lotus flower, a symbol of Lakshmi. The Buddha is the title given to the founder of Buddhism, and means "enlightened one." He was born Siddharta Gautama, a prince of the Shakya clan whose small kingdom was located on the border between India and Nepal. Although exact dates for key events of his life are still in dispute, most scholars believe he was born sometime in the mid-fifth century CE. Siddharta grew up in luxury in the palace of his father, Suddhodhana, a warrior-caste king, and in his late teens married the princess Yasodhara. On venturing outside of the palace, he was shocked by the misery he witnessed—of an old man, a sick man, a dying man, and a corpse—and began to contemplate renouncing his princely life. When Siddharta was about 29 years old, he left his wife and young son to seek religious enlightenment. He spent the next six years in his quest to understand and break free of temporal suffering. He studied under a number of teachers and lived as a wandering, religious ascetic, practicing extreme forms of self-deprivation. He eventually decided to abandon such austere practices and resolved to sit in meditation until gaining enlightenment. One day when he was mediating under a pipal tree in the village of Gaya, later known as Bodhgaya, he reached enlightenment and came to be called the Buddha. For the next 45 years, the Buddha spent his life preaching his doctrine of the Four Noble Truths throughout northern India and attracted disciples and converts. 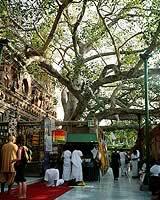 The Buddha died, achieving parinirvana (final nirvana), at the age of 80 in the town of Kushinagar, in Uttar Pradesh. 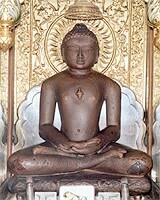 A contemporary of the Buddha, Mahavira (meaning "Great Hero") Vardhamana established the central tenets of the Jain religion in India during the 6th century BCE. Accounts of Mahavira's life differ, particularly between Jainism's two sects, but he was born a prince in Patna as early as 599 or as late as 548 BCE and died of starvation brought on by fasting as early as 527 or as late as 468 BCE. Renouncing his secular life at the age of 30, Mahavira became an ascetic and through fasting, a vow of silence, and meditation, obtained perfection (keval-jnana) 12 years later. Through the principle of ahimsa, non-injury, Jainism teaches that souls can break out of the cycle of reincarnation or the cycle of constant rebirth. Considered the last of Jainism's 24 great saints (tirthankaras), Mahavira taught throughout India for 30 years after achieving keval-jnana and organized Jain adherents into monk, nun, and layman and laywoman orders. How do Indians exhibit their very diverse religious devotions? 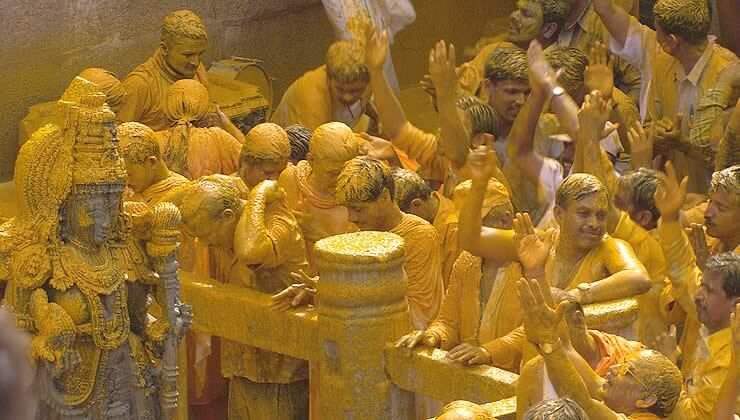 Do we see equivalent celebrations outside of India? What are the natures of these ceremonies? Compare and contrast the ceremonies from the different religions.